The same day that a neighbor planted our mailbox at the Wooden Shoe Ranch, someone knocked it over with their car/truck. They probably were not used to it being there and hit it with a mirror or something. Anyway, that broke a hinge on the door. And, while it had limped along working well for a long while, the other day it broke. Of course, I used duct tape to provide a temporary fix, but realized I needed to get and install a new mailbox. Lynne suggested we get a larger box so it can hold small parcels. 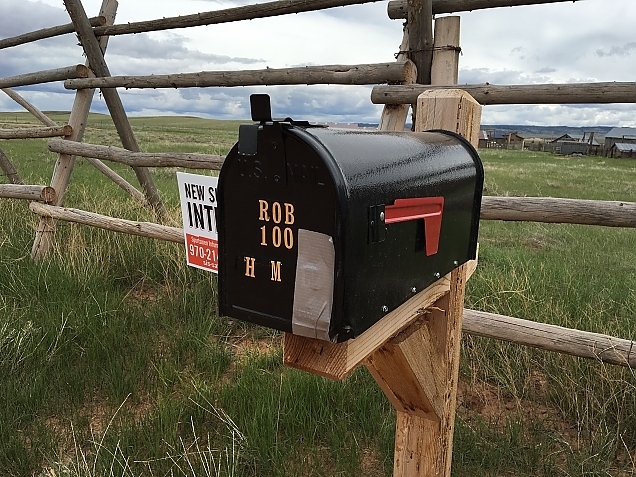 That made sense to me, so we bought a larger (but not the largest available) mail box at the ACE hardware in Laramie the other day. Yesterday, I decided to install the new box. It is about a 25 minute drive from the cabin to the row of rural mailboxes. So, I wanted to make sure I had everything I needed. I charged the battery powered drill. I had studied the old mailbox enough to know how to remove it. I needed a hex driver for the drill. Then, I knew I needed to remove the old mounting board, and not knowing exactly how it was attached, I took an assortment of tools. I took several kinds and lengths of wood screws. 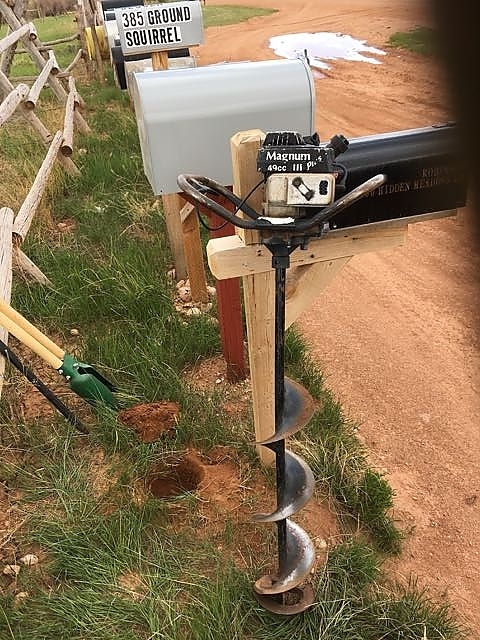 And, since the new box is longer than the old box, I figured I might need to move the post, so I took my trusty post hole digger. Hammers, saws, drills, bits, screws...I was ready. Lynne went with me. I got the old box off easily. The mounting plank also came off using a phillips head bit on the drill. I screwed some long wood-to-wood screws into the post here and there to tighten it up some. Then, I installed the new mounting board. It was clear that I would need to move the post back about 8". I don't want my box sticking out in front of everyone else's. It makes it harder on the mail delivery person, and increases the risk of it getting hit again. So, I took the post hole digger and began to chop away at the ground. It was as hard as a rock. Maybe it was a rock. 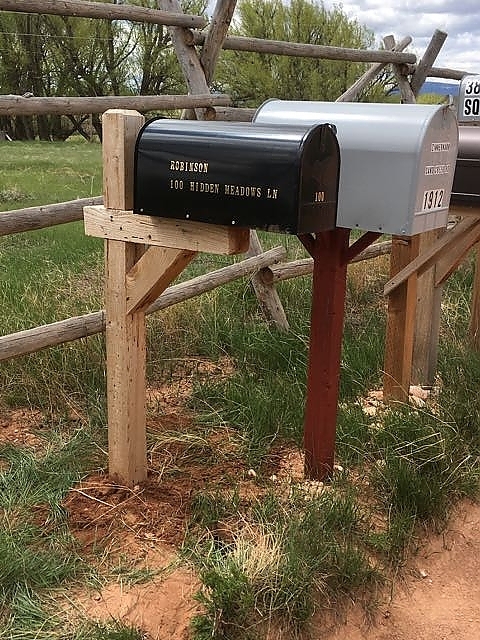 I gave up quickly and decided to go ahead and mount the mailbox, even though it would stick out too far, and then come back with additional tools to dig a new hole. I asked Lynne to hand me the new mailbox from the back of the truck. "What mailbox?" she says. Oh crap. All that preparation and I'd forgotten the damned mailbox. So, I mounted the old one back on the new mounting board with a couple of screws hoping it would last another day. Then, today, I borrowed a gasoline powered post hole digger from a neighbor. Equipped with that, I got a new hole started easily and then was able to finish digging the 2 foot deep hole with the manual post hole digger. Luckily, I was able to simply pull the post from the old hole and drop it back into the new one. I filled and packed dirt around it, and am pretty happy with my job. I even "future proofed" the new post location, placing it further back than absolutely necessary so if we move to an even bigger mailbox in the future, I won't need to dig another hole. So, it does definitely take a PhD (post hole digger) to move a mailbox.